Here are the results of three alternative photo processing paradigms. 2: the same image processed with Adobe Photoshop’s “Accented Edges” filter. 3: the original photo processed by Catherine Scott, using just her hands, some paint, and a paintbrush. 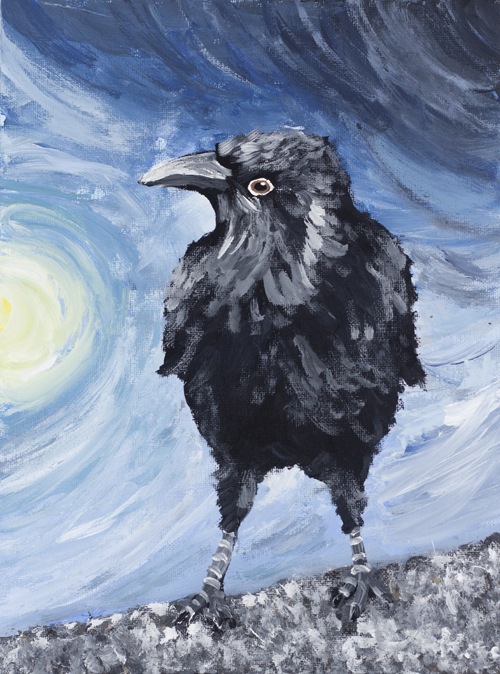 Of the two altered images, I prefer number three, because it takes the crow in a more Impressionistic direction. Catherine points out that it doesn’t use expensive software, and took less time than our so-called “1 hour” photo printing place down the street. Your results may vary. Stay tuned tomorrow for a post on Treetrunk Spiders! This entry was posted on March 12, 2013, in Cheapskate Tuesday and tagged Birds, Cheapskate Tuesday, DIY, painting, photography. Bookmark the permalink. ← Weekend Expedition 8: Return to Reifel!